Airspeed indicator – how to use the most important instrument on a plane? Intricacies of airplane’s speed measuring. This article is a part of my Learn To Fly series. Aircraft need speed to fly. When the speed drops – so does the plane. 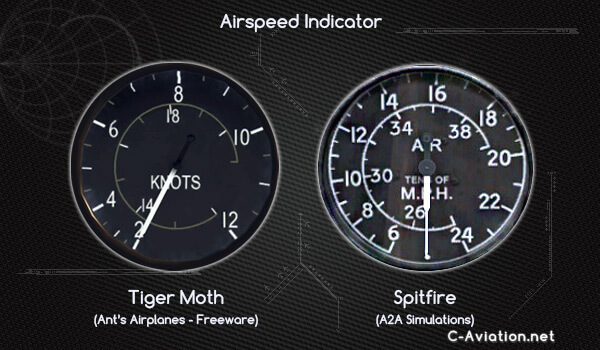 This is why airspeed indicator is the only instrument that is always put on an airplane. Almost every plane in history had it (with the exception of a few early planes – like the Flyer by Wright Brothers). You can safely fly without an altimeter or compass, but human is not capable of determining speed. 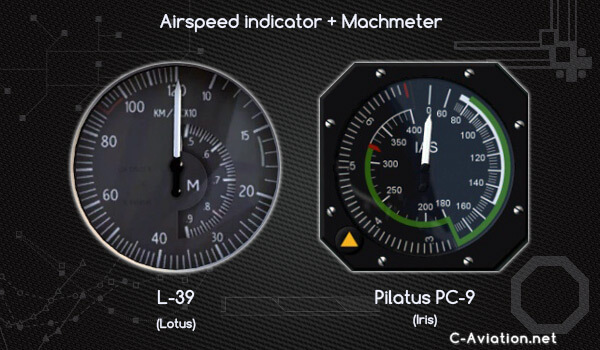 To keep aircraft from stalling (and then crashing) – you need the airspeed indicator. 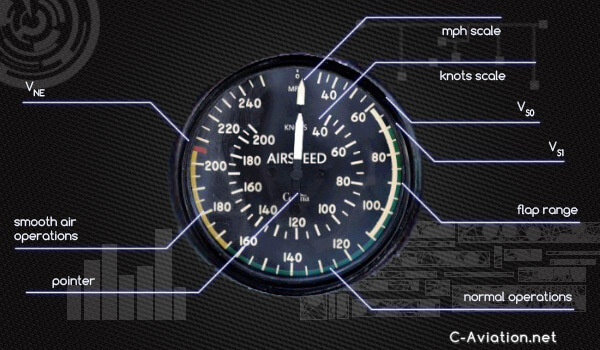 Keep in mind that airspeed indicator shows Indicated Air Speed (IAS) – it’s the speed relative to air surrounding the plane and it takes into account the pressure. 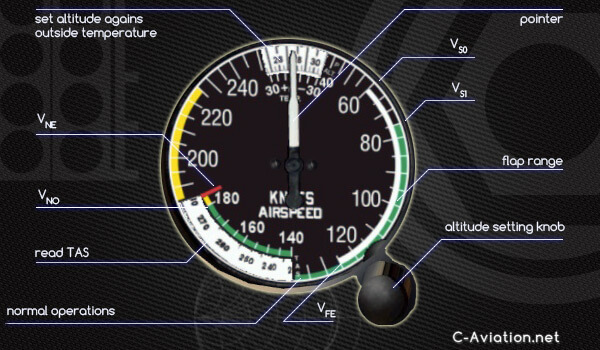 That means that with altitude the indicated speed will drop even if the plane maintains the same True Air Speed (TAS). I will explain the difference between IAS, TAS, CAS, GS later in this article. IAS is the most important of all speeds from the pilot’s point of view. Important speed restrictions (like Vs – stall speed and Vne – never exceed speed) always use indicated air speed. (at high speed and high altitudes Mach number comes to play – once again – this will be explained later). Knots (nautical miles per hour) – knots are the standard unit in modern aircraft. km/h (kilometers per hour) – popular in Russia/USSR so you may expect them in Russian and Soviet planes (e.g. An-2). Also some Polish and Czech planes (e.g. Wilga or Zlin) build under communist rule use km/h. If you fly historical planes – German Luftwaffe aircraft also have their airspeed indicators scaled in km/h. mph (miles per hour) – typical for some U.S. built planes (Piper), almost all British and U.S. aircraft from thirties and forties (e.g. Spitfire, P-47, B-17) – with the exception of naval planes – Navy preferred knots (PBY). When flying fast planes it’s very important to know the relation between plane’s speed and the speed of sound. Much number shows this relation (technically Mach number is not a speed – it’s just a ratio). Each plane that is capable of reaching such speed should have Vmo defined. Vmo is the maximum operating mach number. 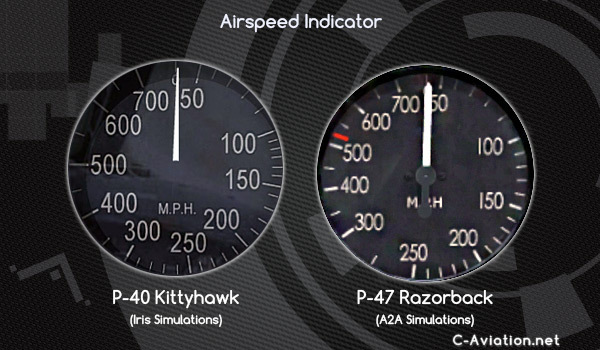 IAS (Indicated Air Speed) – the airspeed shown by the indicator (in some modern planes CAS is shown). 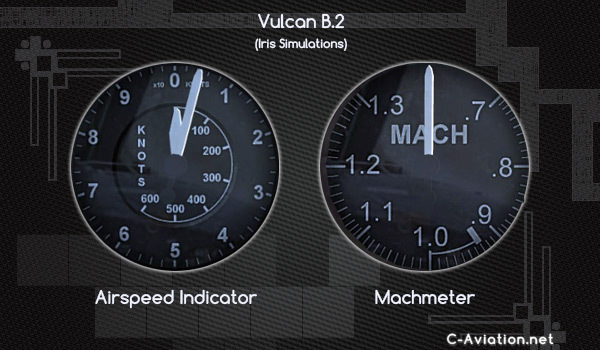 Modern, advanced planes calculate CAS automatically. IAS (CAS) – all values in mph: 100 (109) / 110 (117) / 120 (125) / 130 (133) / 140 (141) / 150 (150) / 175 (171) / 200 (193) / 250 (240) / 300 (290). TAS (True Air Speed). The true speed calculated using CAS, altitude, temperature and pressure. TAS is used in navigation. If you do not know your CAS – use IAS instead. There are several online TAS calculators: http://www.kilohotel.com/misc/cas2tas.html. By a rule of thumb you can calculate TAS adding 2% for every 1000 feet of altitude. For example – at 10.000 feet your calculations would be 10*2%=20%. For 100kn (CAS) the TAS would be around 120kn. GS (Ground Speed). True Air Speed + wind. How to read the indication? There is no problem with a single needle. When there are two needles you use them similarly to clock hands – the larger shows hundreds and smaller – tens. There are also some indicators that move past 360 degrees (a very common feature of historical British indicators). There is an additional scale for high speed. It’s up to you to know if you are cruising at 140 or 340 miles per hour. 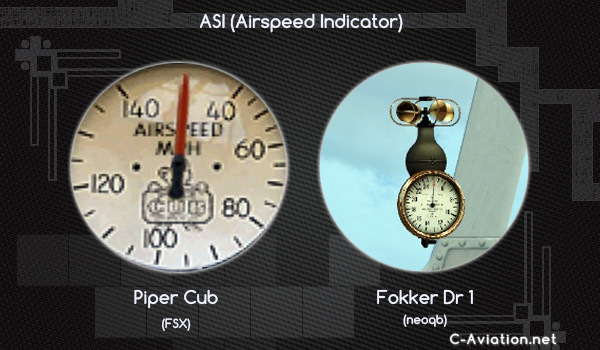 Some airspeed indicators have this very useful TAS indicator. It’s an additional scale that you can set to show TAS. To read it properly you need to set the altitude against outside temperature scale. 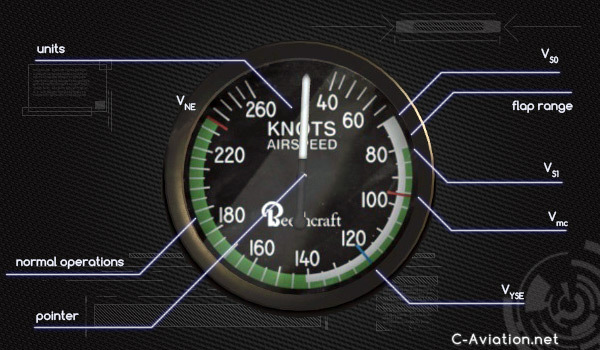 Airspeed indicator - how to use the most important instrument on a plane? Intricacies of airplane's speed measuring.